Technology is unlocking growth in the financial services sector in ways that have never been seen before. You only have to look at the rapid rise of Fintechs and their disruption of the banking status quo for evidence of this. But understanding how to harness technology to best effect is not always obvious. 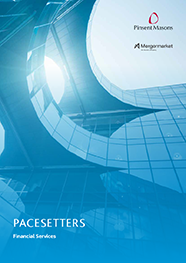 More than half (52%) of respondents to our new Pacesetters report consider the changing expectations of their customers as a key driver of further growth in the years ahead. This means that many firms are focused on the question of how technology can give them a better understanding of both existing and prospective customers. In fact, more than three-quarters (79%) say that the area in which new technology has had the most impact is in understanding and enhancing the customer experience. The ability to use big data and analytics is giving companies a clearer picture of the behaviours and desires of customers and, in turn, how to better meet their needs. This customer-centricity is likely to increase in the future. An overwhelming majority (96%) of firms say that, looking ahead to the next three years, understanding and enhancing the customer experience will be a priority area for their investments into technology. For example, today’s customers are interested in securing products that can aggregate their accounts, savings and investments into a single dashboard that gives them a snapshot of their financial health. New technology can deliver this. However, fast-growing firms must be careful not to under-resource other areas of business that could benefit from tech investment. None of the respondents to our survey are making internal processes, including supply chains and operations, a priority area over the next three years. The very public travails of financial services companies caught out by technology failures highlight the dangers of underplaying such needs. In the most serious cases, businesses’ emphasis on greater customer-centricity has been undermined by failures that have inconvenienced and disappointed customers. The experiences of TSB Bank, for example, have been widely reported and it is still trying to recover from the fall-out of its failed systems migration in early 2018. In the highly regulated financial services industry, moreover, such problems can have compliance implications.